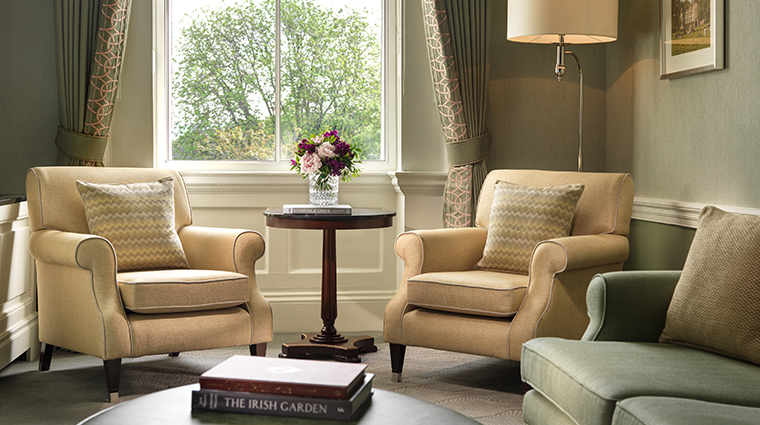 When it comes to distinguishing features, The Shelbourne Dublin, A Renaissance Hotel has them in spades. 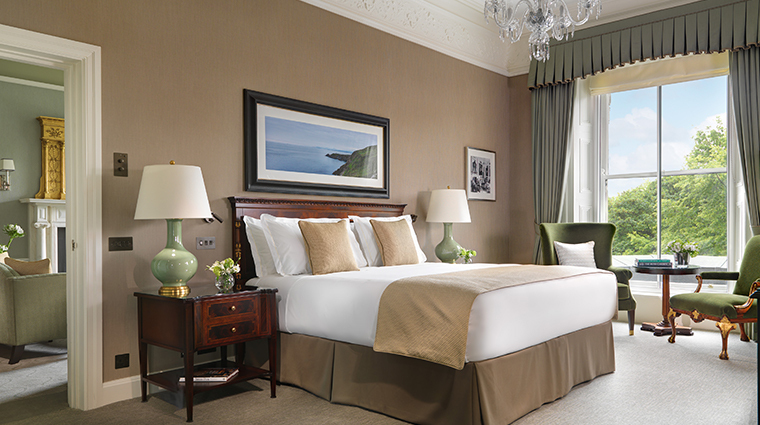 One of the city’s most elegant and historic properties is steeped in tradition, culture and prominence, from the original 19th-century facade, gleaming marble, sparkling chandeliers, decorative stained glass and artwork, to its 265 rooms, many of which overlook St Stephen’s Green Park. 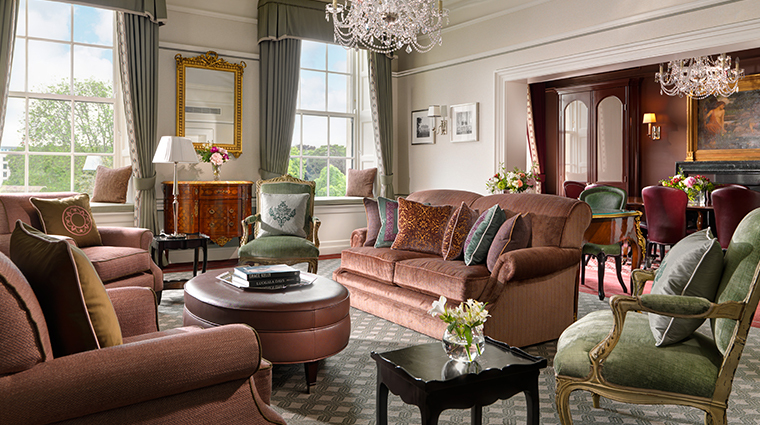 More than 190 years old, the hotel has served as the grand backdrop for some of the country’s most pivotal moments in history — in 1922, the Constitution of Ireland was drafted at The Shelbourne, and one of the two original copies of that historic document can be found in the hotel’s Constitution Suite to this day. 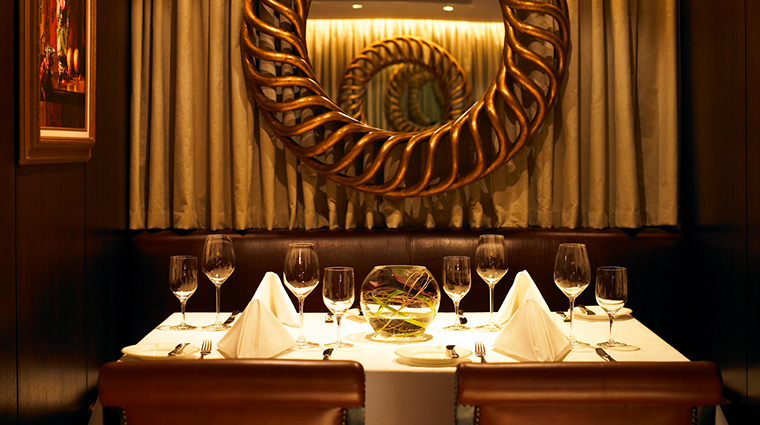 The Saddle Room restaurant’s open kitchen, golden booths and oyster bar provide a buzzy fine-dining experience, while The Horseshoe Bar’s original 1957 Sam Stephenson design, complete with shining brass fixtures, is an intimate Old World nook, created solely for strong drinks and long conversations. 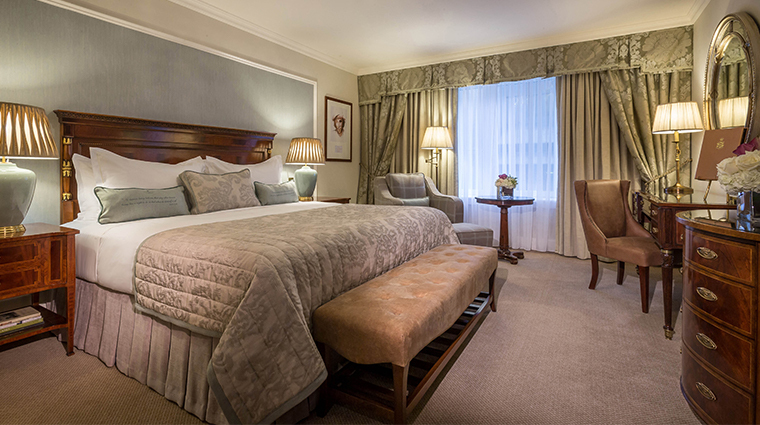 The Dublin hotel is just a few minutes’ walk from the city’s most famous landmarks — Trinity College, Dáil Éireann (Assembly of Ireland) and the National Gallery, Museum and Library — as well as the key shopping and cultural areas. 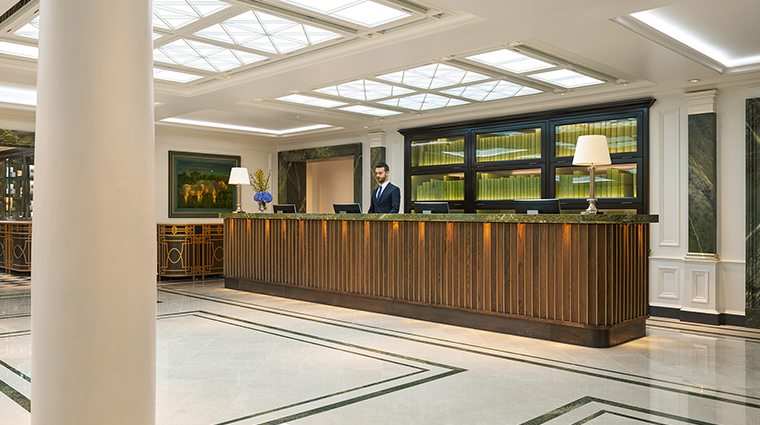 Denis O’Brien has been at the helm of the hotel concierge desk for more than a decade and his knowledge and connections are incomparable. Whatever your heart, or stay, requires, will be granted. 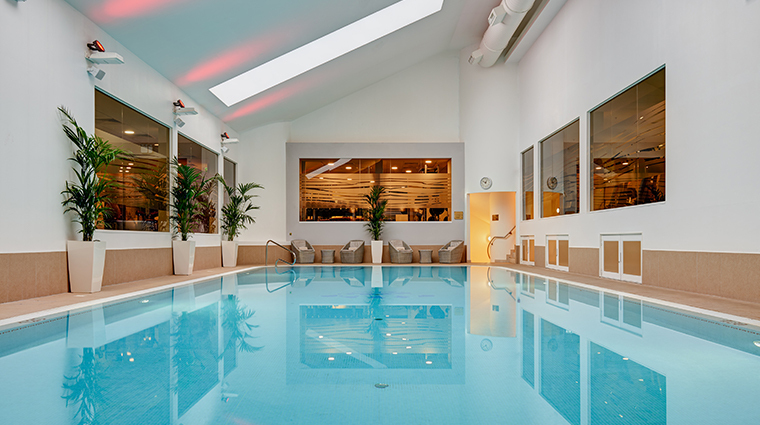 The spa offers top-notch treatments, including a Grace Kelly package complete with a glass of champagne and the princess of Monaco’s trademark hairdo. It’s an ode to the star who was a hotel regular during the 1960s. 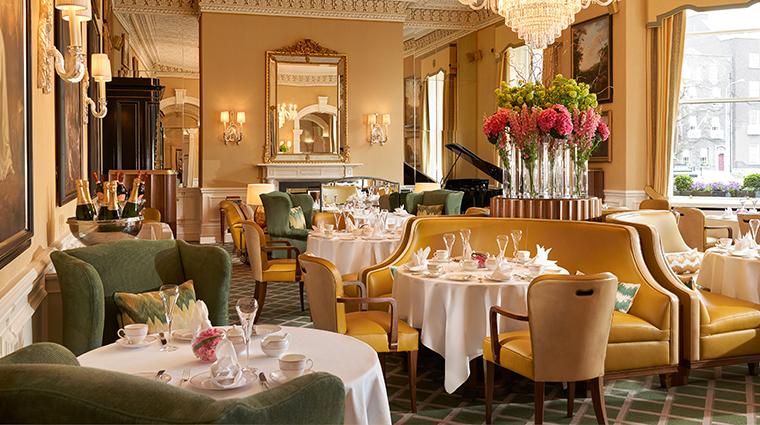 Afternoon tea is a beloved ritual. Reimagined every three months or so by executive pastry chef Katie McLoughlin and served in the opulent Lord Mayor’s Lounge under chandeliers and artwork, it’s a treat for the senses. 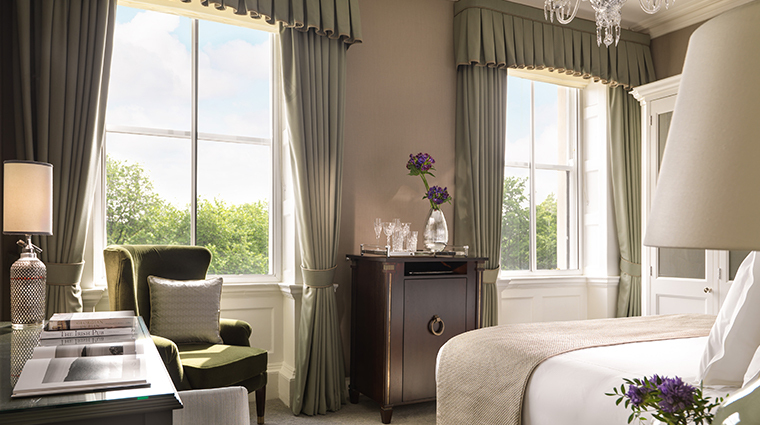 The Shelbourne’s history is rich and extensive, so be sure to pay the museum a visit, housed in the lobby. 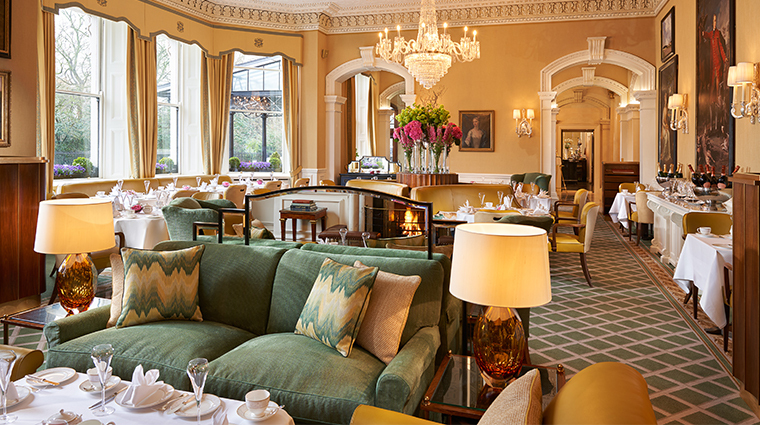 From new contemporaries to established Irish masters such as Barrie Cooke and Louis le Brocquy, The Shelbourne’s artwork collection is also one of its most impressive features. 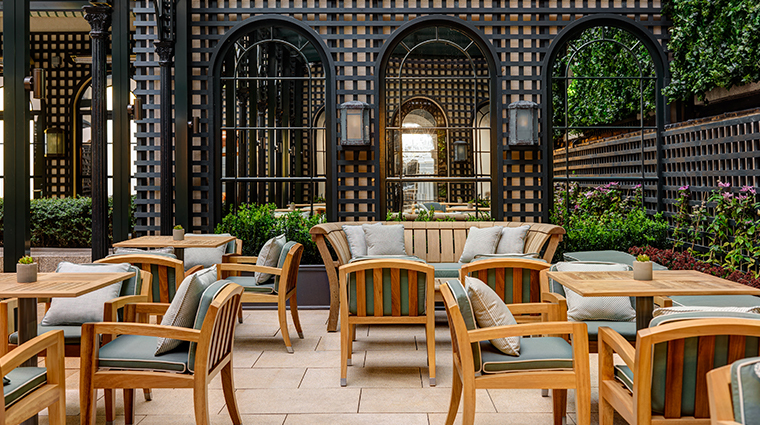 To maintain its authentic ambiance, the Dublin hotel is currently undergoing a mini-renovation to its main entrance, lobby, reception area and bars. The property continues to welcome visitors (though you'll have to use the carriageway entrance to the right of the front door), and be sure to note that The Lord Mayor’s Lounge and The Horseshoe Bar will be closed until April 5. 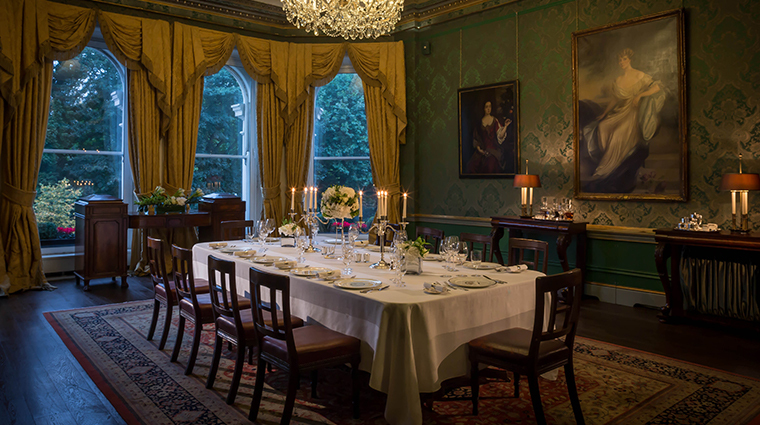 There are 13 historic meeting rooms here, each with its own unique character, style and story, catering to everything from private dining to business conferences. 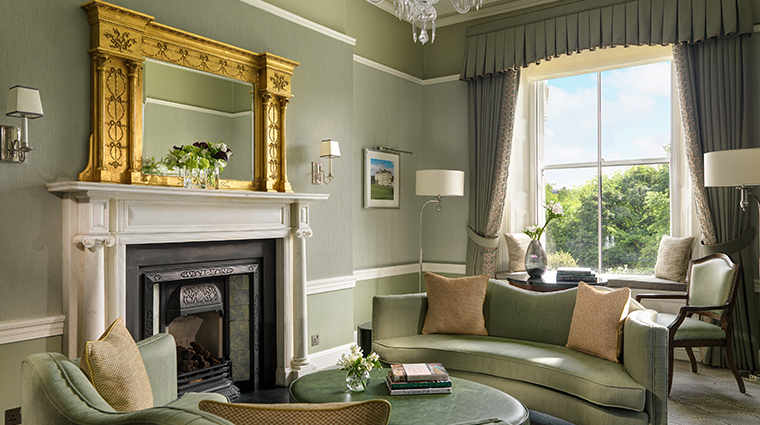 A genealogy butler service is available for guests who wish to trace their Irish roots during their stay. No need to leave the luxury hotel to get ready for a night on the town — the in-house barber and salon take care of grooming needs daily. 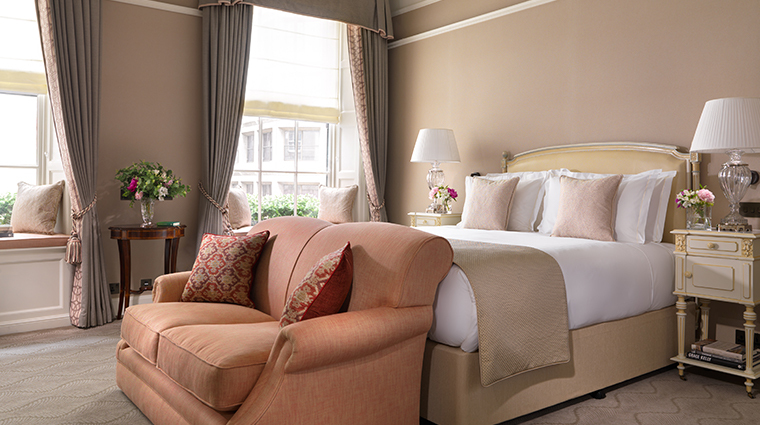 The Shelbourne boasts 265 guest rooms, including 19 suites, which begin at 194 square feet and max out at 1,530 square feet in the opulent Princess Grace Suite. 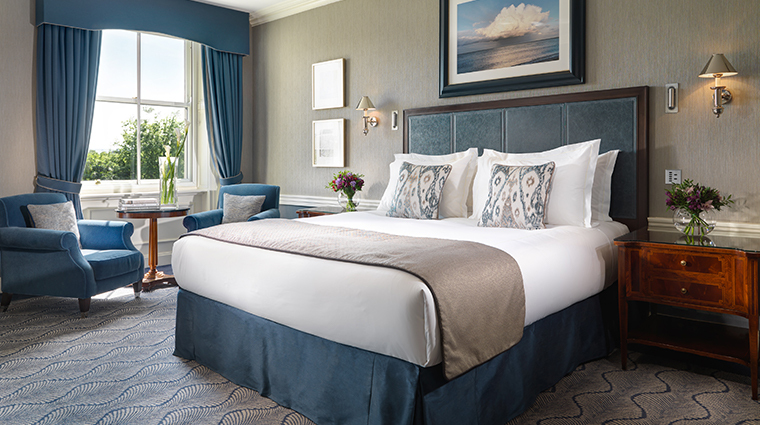 Accommodations come elegantly styled with brocade fabrics, handsome wood desks and dressers and a muted palette of soft blue, lilac, olive, beige and cream. There are seven different room categories available offering various sizes and views — front-facing rooms with vistas over the park are especially in demand. 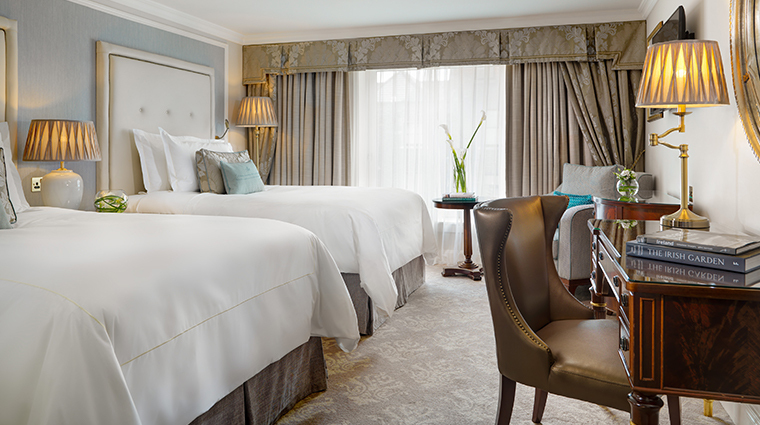 Pillow-top mattresses, marble bathrooms, complimentary Wi-Fi and 24-hour room service ensure a comfortable stay. 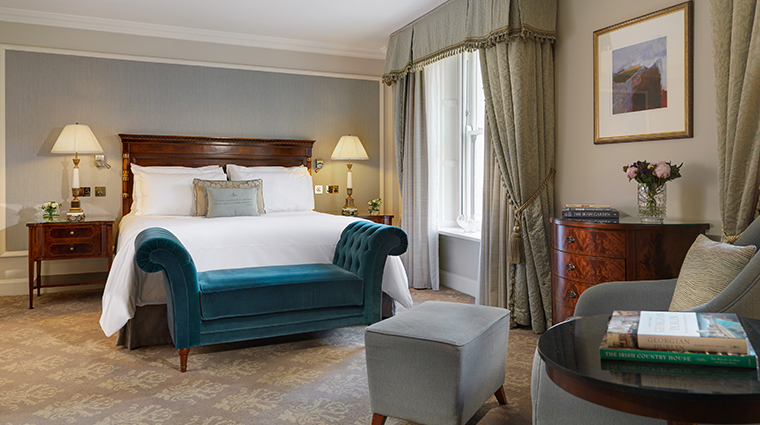 Selected suites have been lovingly named after well-known guests. 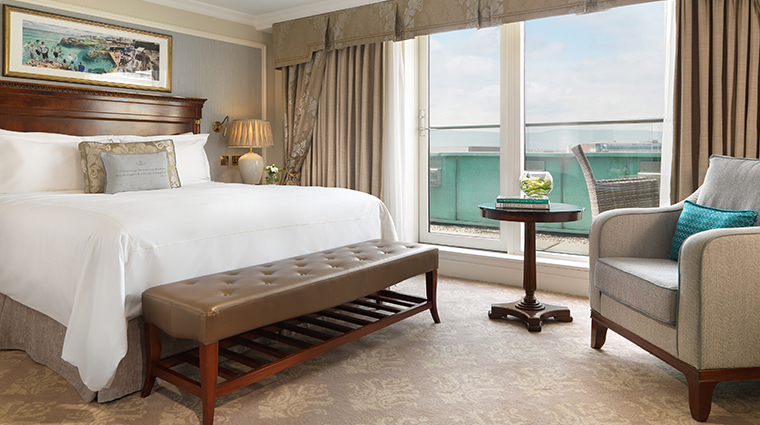 The most famous accommodations include the Princess Grace Suite, John F. Kennedy Suite and Michael Collins Suite. 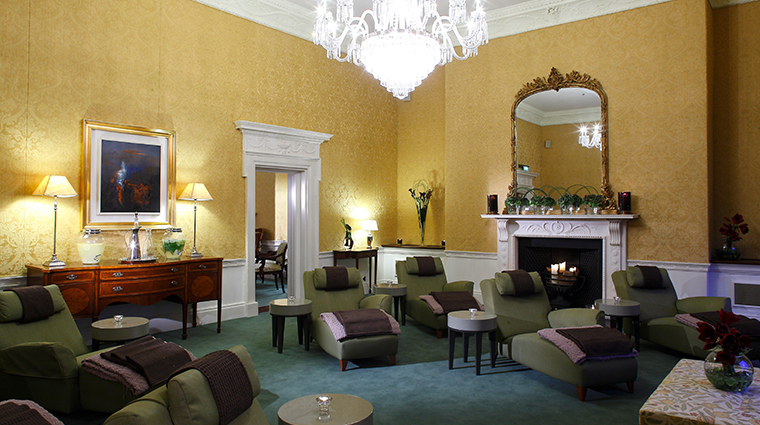 Lord Mayor’s Lounge offers afternoon tea and is a great location for morning meetings over coffee. There’s almost always a notable face or two enjoying an Earl Grey and a chinwag here. No. 27 Bar & Lounge’s design echoes the nearby park and serves as a favorite for light fare and brunch among guests and locals alike. 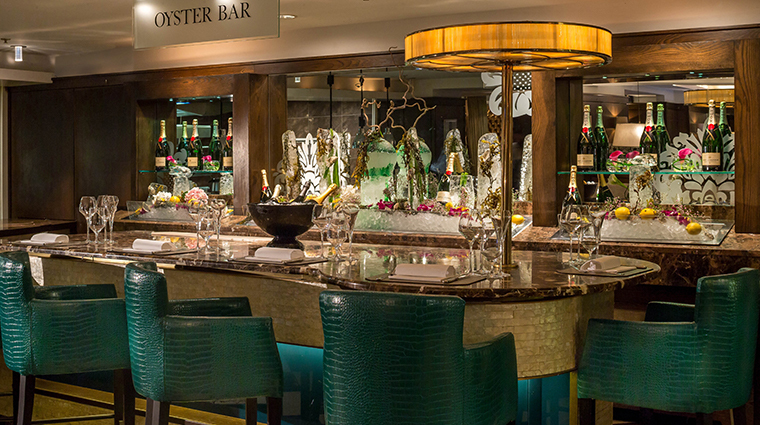 For the full foodie experience, tuck into The Saddle Room’s seasonal tasting menu, with selections of the best local meats, seafood and Irish produce from executive chef Garry Hughes.